NASHVILLE, Tenn. – Conway Twitty, one of America's most-loved musical performers of all-time with 55 No. 1one hits to his credit (second only to George Strait) created a musical legacy that continues to endure and thrive almost a quarter-century after his passing in 1993 There haven't been many releases of unreleased music from the Country Music Hall of Fame member over the years, but that will change October 6 when Country Rewind Records releases TIMELESS. The album will be available on CD at all major One Stops, Amazon.com and select retailers. TIMELESS will also be available for download through all major digital retail outlets and through ConwayTwitty.com. CLICK HERE to pre-order TIMELESS. The songs on TIMELESS haven't been heard since their recording in 1972, included in a series of musical recordings from top artists at the time as part of a United States recruitment program. Performers such as Dolly Parton, George Jones, and Waylon Jennings would record fifteen-minute performances that would be distributed to over 2,000 radio stations throughout the world intended for commercial release. Tom Gramuglia of Country Rewind Records, says that he can’t wait for fans to hear these recordings - which put the recorded genius of Conway Twitty on full display for all to hear. 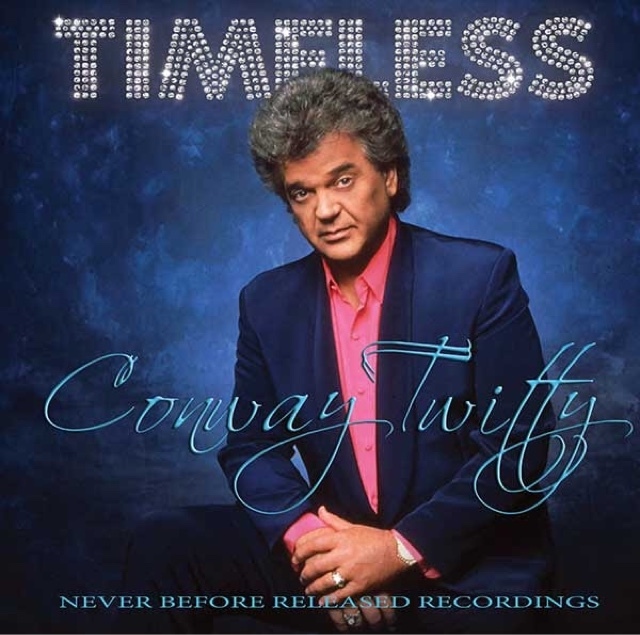 The music on TIMELESS is a mixture of many of the songs that made Conway Twitty a household name, such as his signature song from 1970, “Hello Darlin,” as well as a pair of deeper Twitty cuts that are no less historic or powerful - “The Image Of Me” and “Next In Line” (his first top ten and number one hits, respectively) from 1968. His band, the Twitty Birds - featuring steel guitar wizard John “Buttermilk” Hughey, bassist “Big Joe” Lewis, and drummer Tommy “Pork Chop” Markham - are featured on TIMELESS, as well as new musical accompaniment produced by Twitty’s daughter and son-in-law, Joni and John Wesley Ryles. Joni - who performed with her father on the 1975 classic “Don’t Cry Joni” - says this music is something that Twitty’s loyal following will want to add to their collection. “When I heard it, I was blown away. I couldn't be prouder of Dad's performance, and the Twitty Birds did such a great job. Every Conway Twitty fan needs to hear this. My family could not be more pleased to celebrate his life in music with this compilation of treasures.” Ryles says that her family has been pleased to see that his music continues to warrant praise and attention from many of today’s biggest stars - something for which she is grateful. For more on TIMELESS and other Country Rewind Records productions, visitcountryrewind.com.